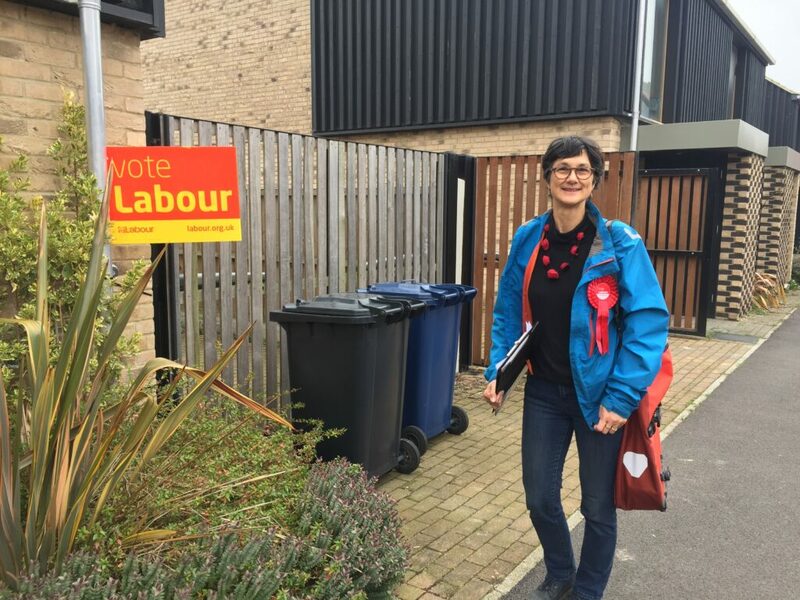 Today is polling day for the local elections and I’m spending the day reminding supporters to get out and vote – if you’re in Trumpington today then you may see more or another Labour supporter with a clipboard, a pile of reminder leaflets, and a determined expression! Thank you to everyone for your support – it’s been wonderful to meet so many people during this campaign, and I look forward to the count tonight. 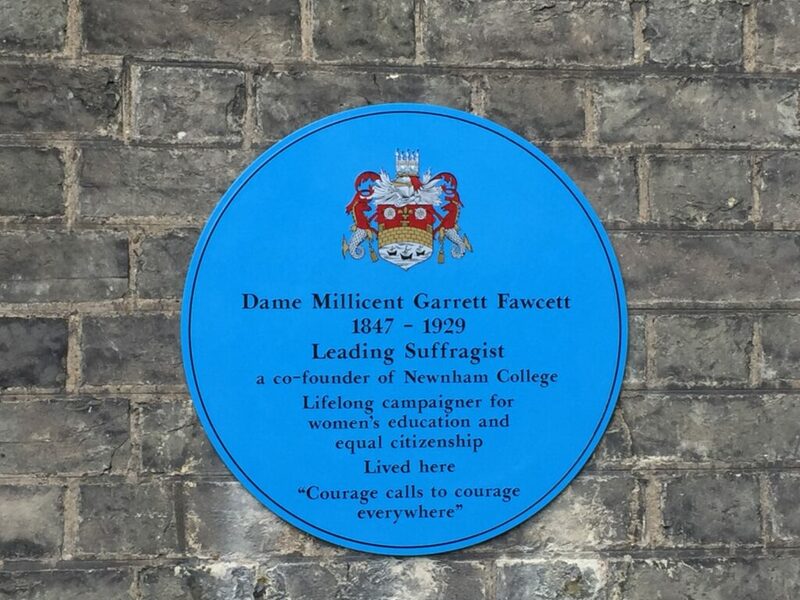 I was out canvassing today on the final weekend of the local election campaign, and took the opportunity to visit the blue plaque put up recently in honour of one well-known former resident of Trumpington – Dame Millicent Fawcett. 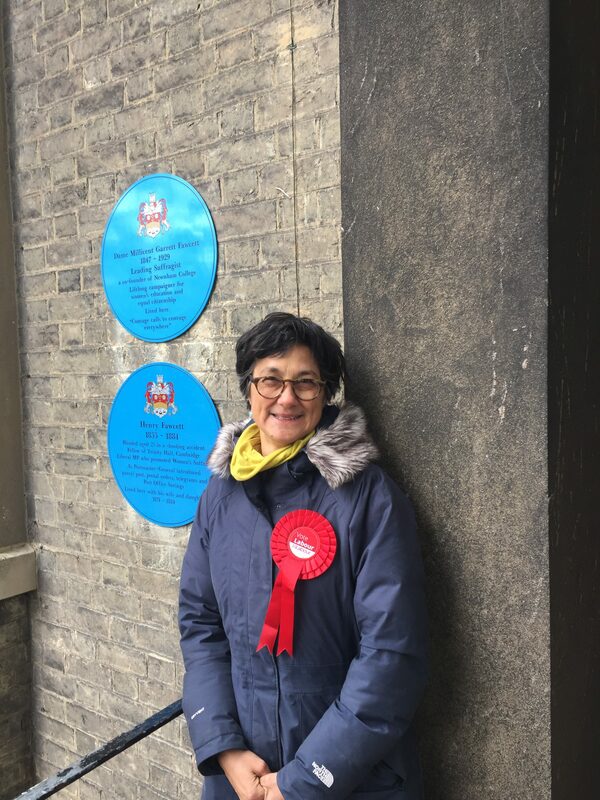 The plaque on Brookside acknowledges this incredible woman and her fight for votes for women, on the centenary of some women getting the vote – but I never forget that not everyone gets to vote, even today. I grew up in a place and at a time when none of the adult members of my family had a vote – Hong Kong when it was a colony – and even now their votes count for little now that it is a special administrative region of China. Perhaps that’s one reason why I value my own vote and have impressed on my daughters and all the young people I know how important it is to use their vote. It’s not just about voting, it’s also about who you can vote for. In democracies it is important that we have a diverse group of elected representatives – not just women but people from different class, ethnic backgrounds and social groups, of different sexual orientation, with varying pasts and aspirations and ideals and interest, so that the discussions at councils and in parliaments and assemblies can reflect the glorious variety of the world and not just the views of a bunch of like-minded lucky people. We need diversity so that people can bring a different perspective, one that is grounded in their life experience and valuable wherever it is heard. That’s why I’m standing, along with the other women candidates: we want to bring that perspective to Cambridge City Council. And I hope that all women will consider standing for other things, because nobody is going to ask us to take over from the men – we have to stand up and fight for it just as we women candidates are doing this time around. Every year the fine people at the Cambridge Cycling Campaign send out a survey to all of the candidates for local elections asking for our views on a range of cycling-related issues. 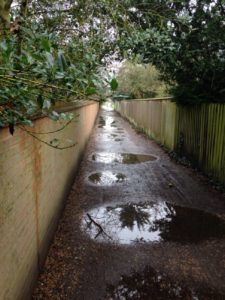 This year’s survey will be published on April 24 but I thought I’d share my thoughts – and some photographs I took recently while cycling around the southern part of Trumpington. As a candidate for local government, I have spent a lot of time considering ways to make Trumpington better. As an architect, I think about the built environment, and the way that physical changes can make people’s lives better; as a regular and frequent cyclist, I have noticed a number of things around the ward that I think need to be reconsidered. 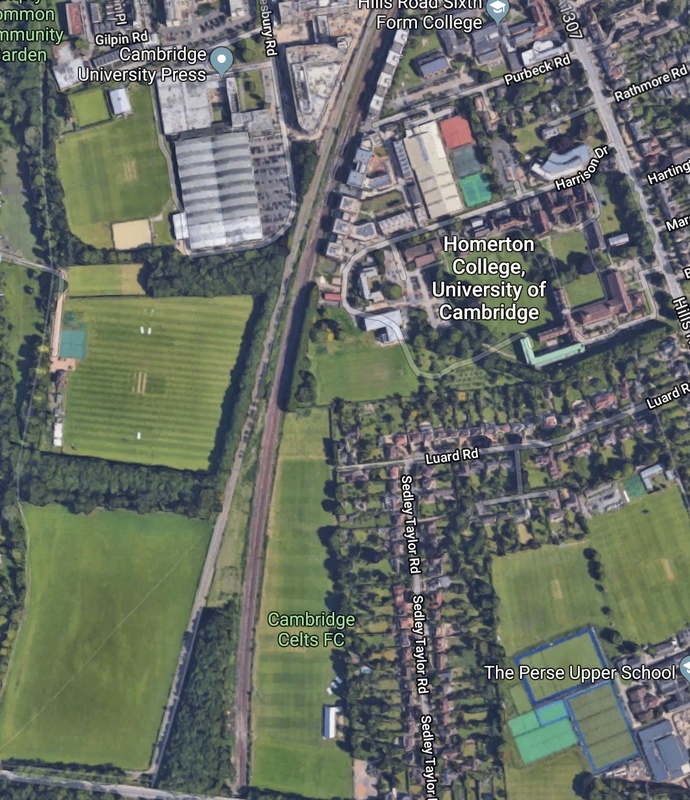 As I engaged with the Cambridge Cycle Campaign about transit choice in Trumpington, I realised I had a lot of strong opinions about the state of infrastructure across our community that I wanted to explore in greater detail. 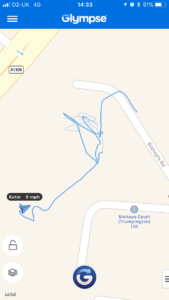 This blog post is an outgrowth of that process. 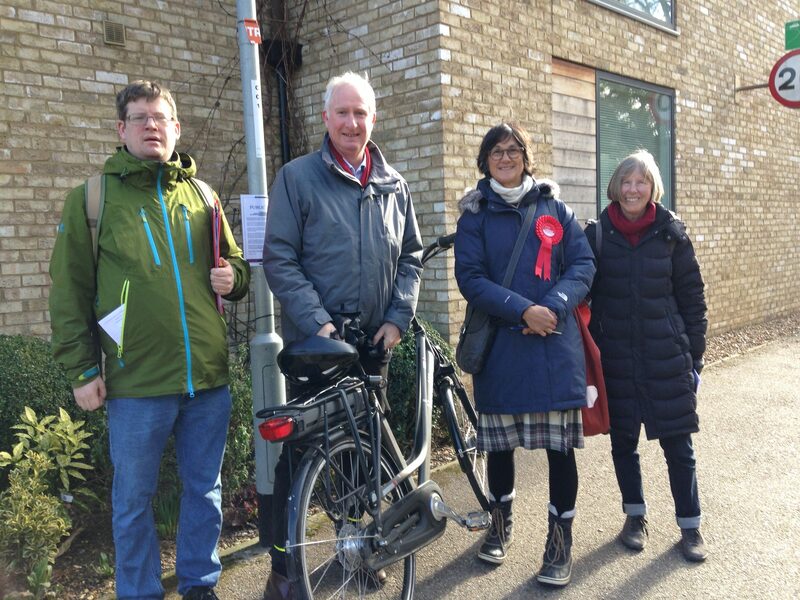 I have lived in Cambridgeshire for over thirty years and have always cycled – when I’ve lived in the City it’s been my main way of getting around. All of my family members cycle regularly and our garage is filled with bikes. I’m obviously concerned about road safety for my children, and myself as I grow older. 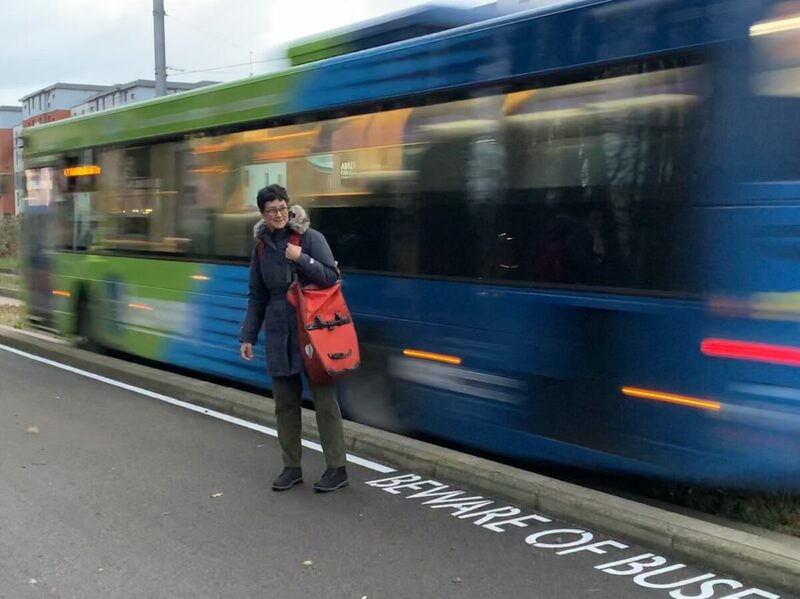 When I consider transit provision, my priority is to protect the most vulnerable road users, and improve their experience first – this includes pedestrians, but also the elderly, people with limited mobility, and anyone else who struggles to get around. The ward has seen major transit improvements in the last few years with the introduction of the guided Busway and new, wide pavements and cycle lanes along Addenbrookes Road, and in the award-winning design of some of the new housing estates. There is also good cycling provision from Bateman Street south to Alpha Terrace, and wide pavements along the High St.
That said, there is a dramatic drop-off in quality from Alpha Terrace to the M11 junction. There are two areas about which I feel particularly strong: first, the junction that governs access to Waitrose, particularly the right-turn lane facing south; and second, Hobson Avenue junction across the guided Busway. The right-hand turn lane into Waitrose is only long enough for about six cars to queue, creating backups that stretch north – sometimes literally for miles. The result is a dangerous junction for cars and especially for cyclists (there is no pedestrian crossing, which is a separate issue), as well as traffic congestion along the length of Trumpington Road. 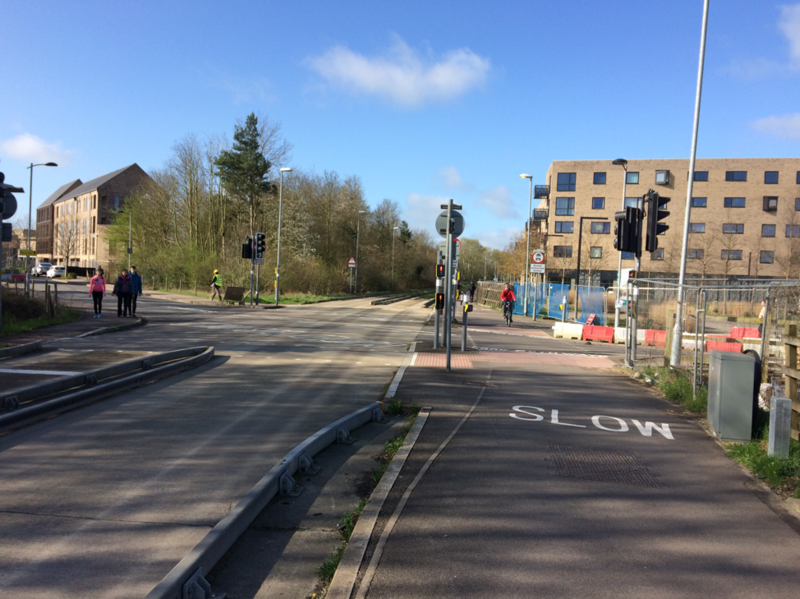 Hobson Avenue, where a road crosses the guided Busway, is a dangerous intersection that requires a two-pronged approach: it needs changes to the signalisation and road users need to be educated about the dangers inherent in the junction. I would seek to restore priority to the Busway users. At present, not only is there a long wait for the signal to change, it is too short for anyone but an able-bodied adult to cross in time, which is also something that could be improved. There are also many areas of Trumpington that need to be re-considered. The new junction of Addenbrookes Road and Shelford Road is disappointing because only three of the four roads are signalized – so pedestrians need to cross three roads to get across the street. There are other small changes – such as paving unpaved cycle tracks around the ward, and creating safe routes to primary schools – that could have a major impact on providing transport choice. The crossing at Hobson’s Ave should prioritise Busway users. As a resident of the Novo estate pointed out, many of the roads in new estates in Trumpington have not been adopted, and as a result see high traffic speeds and are becoming rat runs. There are also pedestrian/cycle tracks that, though heavily used, have fallen into disrepair, with inadequate drainage making them impassible after rain. 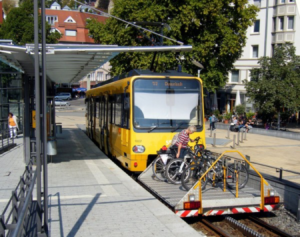 Improving them – preferably without closing them, as that entails substantial disruption to regular users – would make a big difference to people who are car-free or experience limited mobility. Ideally, the whole of Trumpington should be assessed for vulnerability, so that we can build resilience into the design of the city. The examples above are things that residents have brought to my attention or that I have noticed in my travels around the ward. In addition to physical improvements, there are a few things I would like to see that would support better transit opportunities for all Trumpington residents. I would love to see bike racks added to Busway vehicles, preferably of the sort shown below (from Stuttgart, 2013. The more common fold-down racks only fit two cycles at a time). 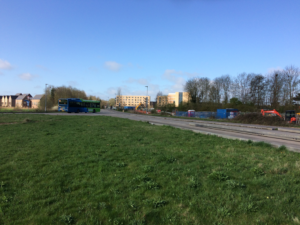 Adding an additional bus stop north of the turn-off to Addenbrookes would mean many more buses serving the Trumpington community. Making vulnerable road users a consideration in travel management plans (included in planning applications) would force developers and contractors to account for the impact of construction on pedestrians and cyclists, and mitigate situations where, for example, cycle lanes are obstructed by construction vehicles. 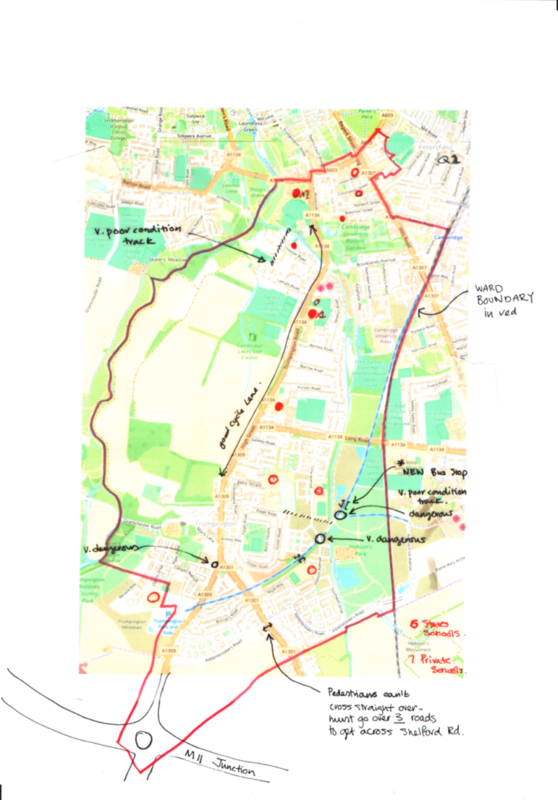 Trumpington has six state schools and seven private schools, and so cycling to and from school is a real prospective growth area in Trumpington. My first priority is the stretch of road south of Alpha Terrace, for families with children at Trumpington Meadows Primary School. Many of the children who attend the school need to cross Hauxton Road and they deserve a safe and pleasant route to school. Traffic in the Newtown area, where there are five schools, is particularly bad during school term time at rush hour. At other times of day and year, it is a relatively pleasant cycling environment. If elected, I would seek to work with private schools to make school drop-off a safer and more seamless experience for everyone. We should work with the schools to create a better system – one that provides a more seamless experience for pupils and parents, and also helps to minimise traffic congestion for residents. In Trumpington we have both an opportunity and an obligation to address school traffic, which has an impact on everyone’s quality of life. Adding a bus stop north of the Addenbrookes turn-off would make the buses more useful for Trumpington residents. As a regular and frequent cyclist, I know of many places in Trumpington that could be improved for standard and non-standard cyclists alike. Each deserves individual consideration, but I would love for the ward to receive a comprehensive assessment of cycling strengths and weaknesses. 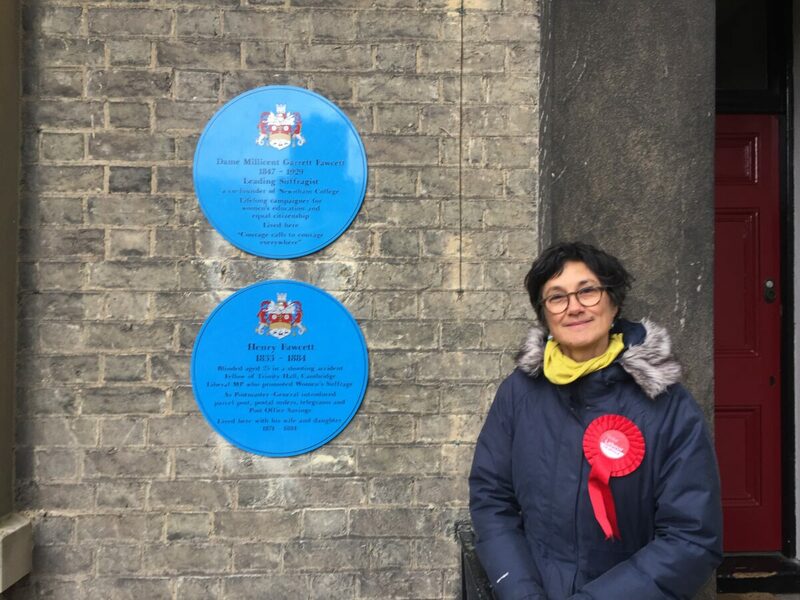 In the meantime, I have learned so much from residents of Trumpington as I have been campaigning, and I have enjoyed getting a more in-depth and granular understanding of the issues that affect residents every day. Lots of Labour Support in Trumpington! It’s just over two weeks to the Local Elections on May 3 and the last day you can register to vote – and remember that students can register and vote at both college and home addresses, and all EU citizens can vote in local elections. 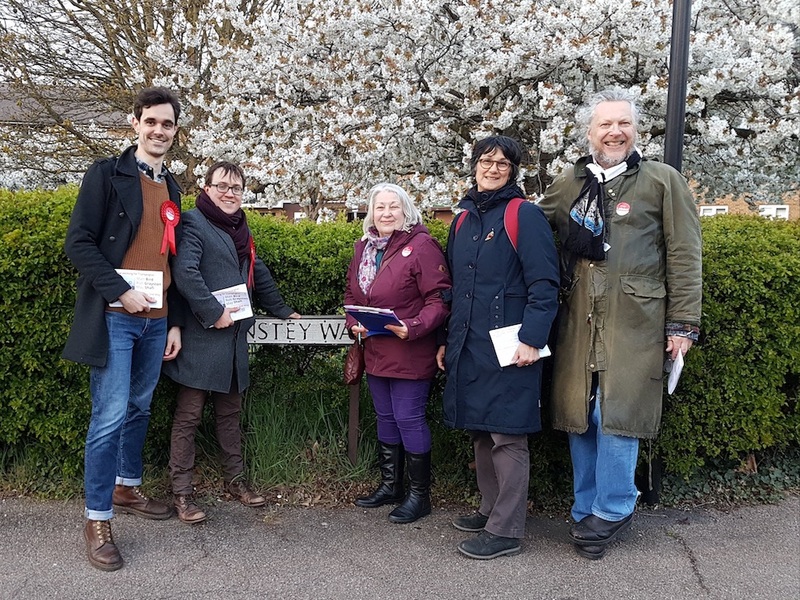 It’s been great to see so much support on the doorstep in Trumpington as our campaigners go out talking to people – I hope to meet many more of you between now and May 3. It’s a month until the local elections on May 3 and campaigners, canvassers and candidates across the City are out talking to people about the issues that matter and asking for support for Labour. 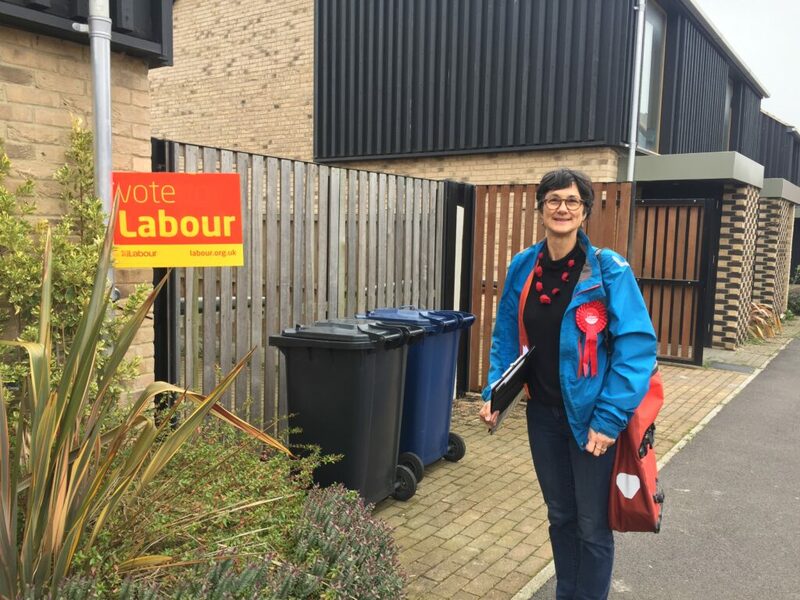 I’m proud to be the Labour candidate for Trumpington, and will be out almost every day between now and the election. Here’s my first campaign video – do get in touch if you’d like to discuss any of the issues raised. 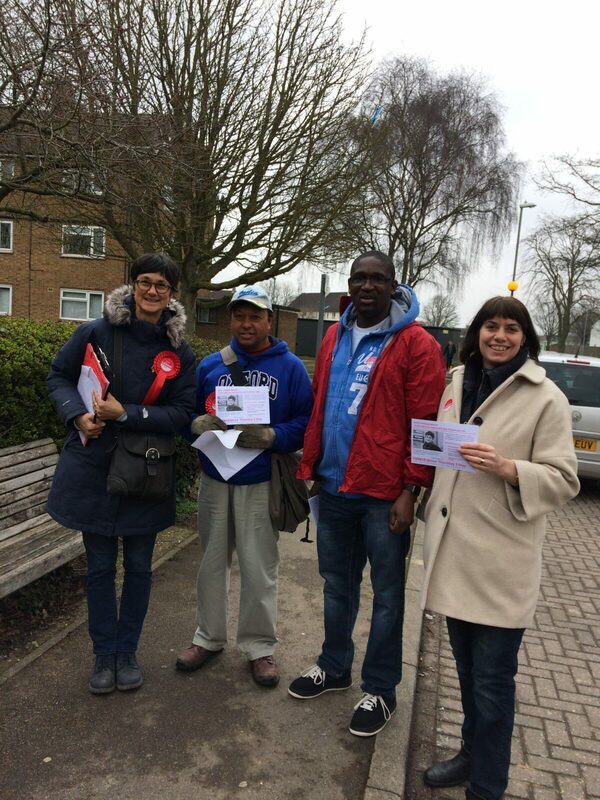 As the campaign for the City Council Elections on May 3rd gets into full swing, our team has been out again in Trumpington, knocking on doors to find out more about the issues that matter to people. We’ve heard about traffic congestion, concerns that there are too few local shops, and of course concerns about local transport. We’ll be out every weekend – and some weekdays – between now and the election. 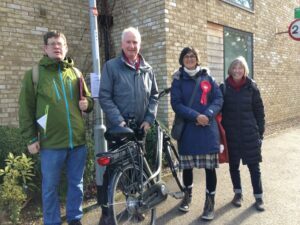 I’ve been out in Trumpington with other Labour activists, talking to local people and asking about the issues they face that we may be able to help with. A lot of you are concerned about the rapid growth of Trumpington and the strain it places on roads and other services, for example. 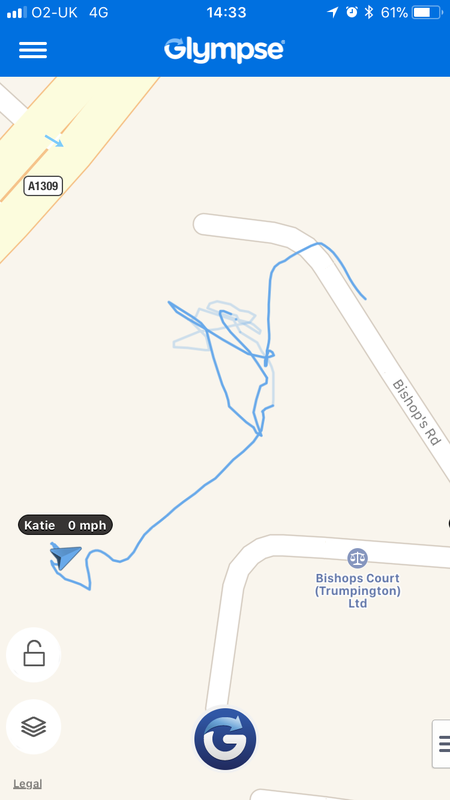 It’s really enjoyable to go around meeting people – but it’s a lot of walking, as you can see – this was my trip around a block of flats! I’ll be out again this afternoon and hope to meet lots of people.